Videos in Flash format (SWF or FLV) have gained plenty of popularity since YouTube was launched a few years ago, because they only require that we have one plug-in installed on our computer to watch and hear any multimedia file codified in this format, allowing us to do without codecs or special players. 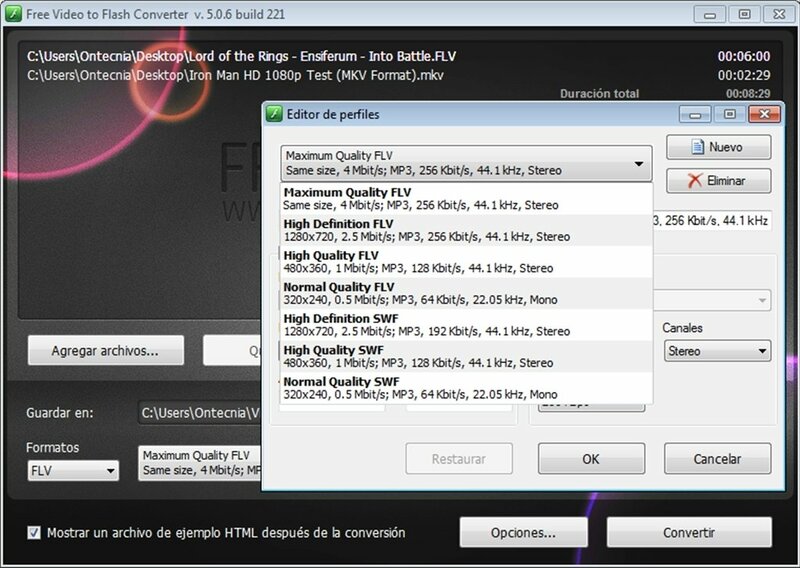 Free Video to Flash Converter es a free application that will allow us to convert all our video collection to Flash very quickly, with dozens of options (size, quality, type of player included,... ). All we have to do is select a video from our hard drive (AVI,MPEG, MPG, MP4, M4V, WMV, ASF, MOV, QT or 3GP), the output folder and in a matter of minutes we will be able to start creating our own video website with the videos stored on our PC. It also includes an option to crop a film so that we only convert a section of it. Transcode all your film and video collection to one of the most popular formats that exist, thanks to Free Video to Flash Converter.